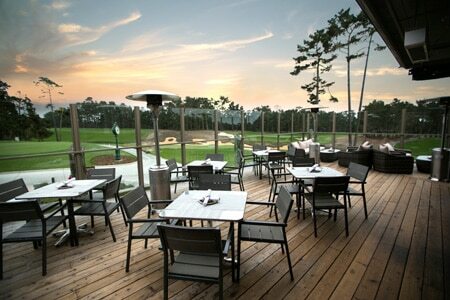 Sleek design and panoramic views of Poppy Hills golf course set the stage for the California cuisine. : Porter’s boasts panoramic views of Poppy Hills golf course from indoors and the pet-friendly patio. It also has a sleek design, and the food lives up to the setting. Dinner is an abbreviated menu for early diners; lunch offers more choices. Dishes are playful but approachable. Pulled pork lettuce wraps are billed as an appetizer, but could be a meal in themselves. The "Korean" Philly cheesesteak takes juicy shavings of tri-tip and adds scallions and Muenster, along with daikon radish and some not-too-strong kimchi; the interplay of flavors and textures is intriguingly tasty, and Sriracha aïoli adds a bit of warmth. The Porter burger comes with house-made onion marmalade, while the salmon and artichoke over squid ink tagliatelle is funky comfort food. House-made ice creams put an exclamation point on the end of the meal.